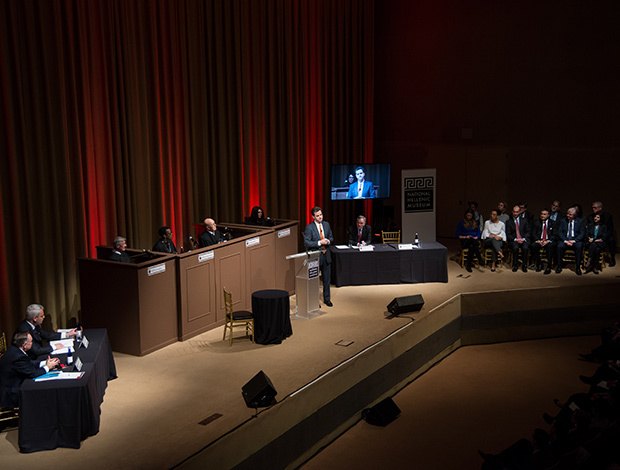 A jury composed of community leaders, academics and journalists, along with an audience of hundreds, presented their verdict of guilty to a presiding panel of federal and state court judges in the National Hellenic Museum’s Trial of Megacles, held recently in Chicago. This fifth installment of the NHM Trial Series debated whether the ends justified the means when a government leader lied in the name of protecting democracy. This time, just as it was determined in 632 BCE, it does not. 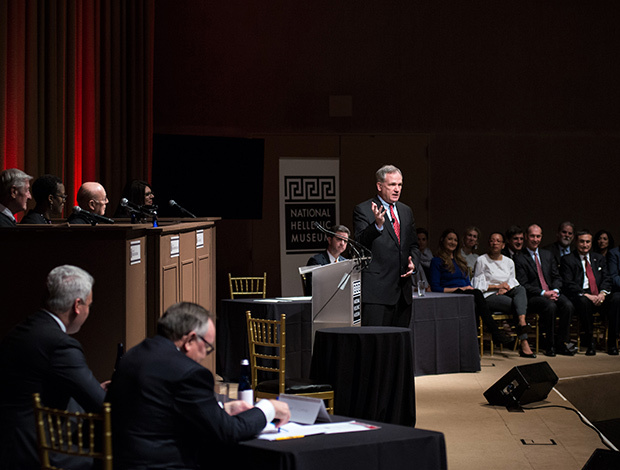 Moderated by WGN’s Andrea Darlas, the event featured a re-trial of Megacles, an ancient Athenian leader who ordered the death of a traitor to the city’s power. When Cylon, a populist Olympian hero, led an unsuccessful coup and then claimed sanctuary in the Temple of Athena, Megacles promised him and his followers a fair trial and that his life would be spared if he left the refuge of the temple. After negotiations, and even tying themselves to the temple, Cylon and his men agreed to leave its safety. Despite his promise, Megacles ordered them stoned to death. The leaders of Athens put Megacles on trial and he was found guilty and punished for violating the sanctity of supplicants, and subverting the laws of Athens. Furthermore, his entire family was cast out of the city for six generations and, according to legend, marked with a curse. This historical event is thought to be a precursor to the further development of democratic principles. Historians have written about it ever since and recent archeological discoveries have identified the bodies of what are believed to be the followers of Megacles. 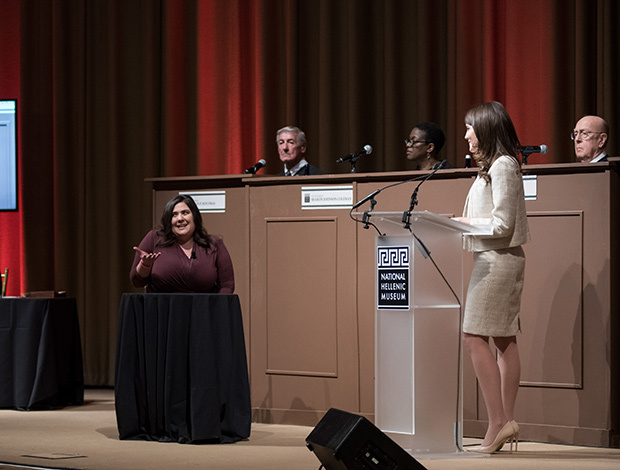 The judiciary panel was composed of four judges: from the Seventh Circuit Court of Appeals Judge William J. Bauer, U.S. District Judge Charles P. Kocoras and Cook County Circuit Judge Anna H. Demacopoulos and, new this year, U.S. District Judge Sharon Johnson Coleman. Prosecuting Megacles for violating the sanctity of supplicants and subverting the laws of Athens were former U.S. Attorney Patrick J. Fitzgerald of Skadden, Arps, Slate, Meagher & Flom and Patrick M. Collins of King & Spalding. Megacles’ defense team was composed of Robert A. Clifford of Clifford Law Offices and Tinos Diamantatos of Morgan Lewis. Christina Faklis Adair of Gozdecki, Del Giudice, Americus, Farkas & Brocato examined expert witness Katherine Kelaidis, Ph.D., a Visiting Assistant Professor at DePaul University. 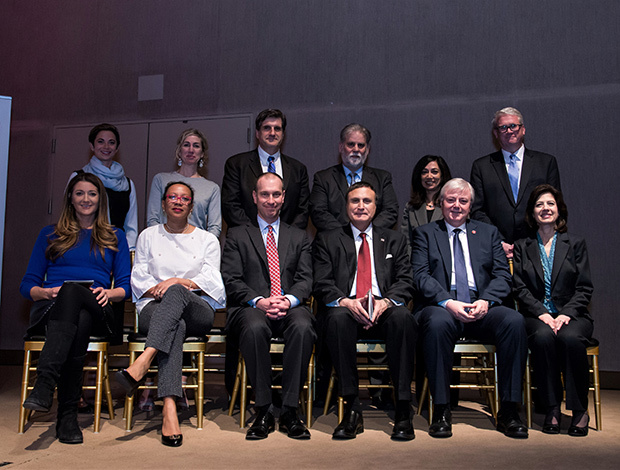 Serving as distinguished jurors: Cynthia Photos Abbott, Vice President & General Counsel, WBEZ, Chicago Public Media; University of Illinois at Chicago Chancellor Dr. Michael D. Amiridis; Cook County Public Administrator Hon. Louis G. Apostol; George Apostolides, Partner & Vice Chair National Litigation, Saul Ewing Arnstein & Lehr, LLP; Lori D. Barcliff Baptista, Ph.D., African-American Cultural Center Director, University of Illinois at Chicago; WGN Host Anna Davlantes; Illinois State Rep. and House Minority Leader Jim Durkin; Calamos Wealth Management Sr. Vice President Anita Knotts; Cook County Circuit Court Judge Anthony C. Kyriakopoulos; Thomas G. Massouras, Trial Attorney and Special Assistant U.S. Attorney, U.S. Dept. of Housing and Urban Development Office of Regional Counsel; Chicago Tribune Columnist Heidi Stevens; and Lorien Yonker, Research Associate, The Art Institute of Chicago Dept. of Ancient and Byzantine Art. The verdict breakdown was 11 guilty and 1 not guilty among the jury of 12. 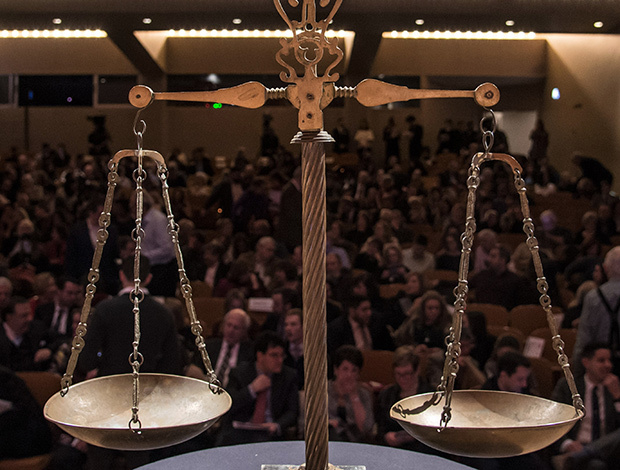 The jury’s determining verdict was supported by the hundreds of attendees when the scales of justice were literally tipped to guilty by the majority of the voting chips. The esteemed panel of judges unanimously found Megacles guilty, while acknowledging the strength of the arguments by defense counsel. 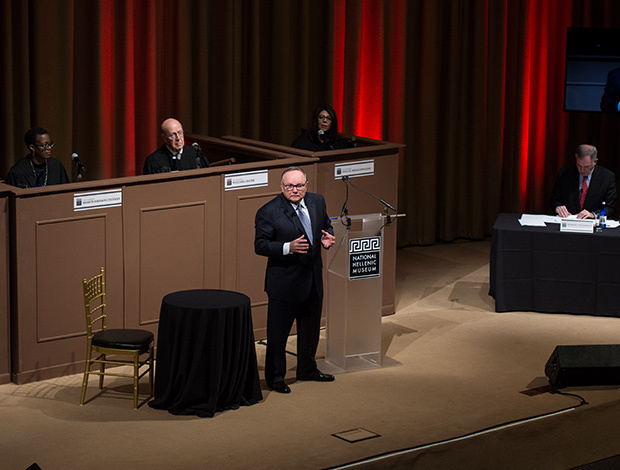 The event affirmed the importance of holding a trial of the accused, even during a time of violent insurrection. Judges, jury and citizen audience noted that due process continues to be crucial to democracy, just as it was in the earliest days of Athens. The Trial of Megacles was approved for 1.5 hours Ethics CLE by the Attorney Registration & Disciplinary Commission of the Supreme Court of Illinois. The dynamic NHM Trial Series has grown both in reputation and following over the years. 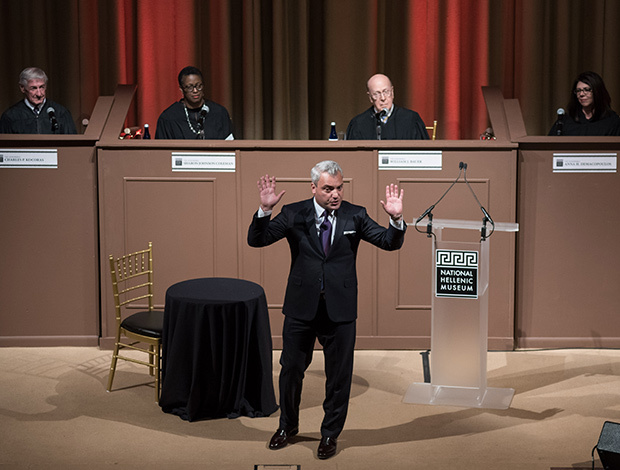 The 2016 Trial of Antigone was broadcast on WTTW-TV (PBS Chicago) in May 2017 and nominated for a regional Emmy. The 2017 Trial of the Parthenon Marbles is expected to be released on DVD soon. 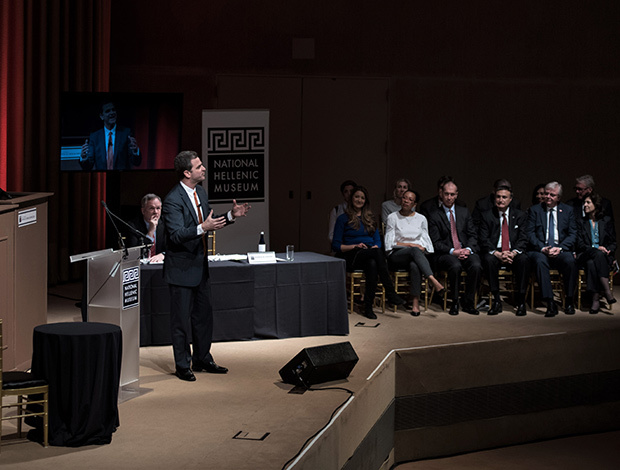 The National Hellenic Museum (NHM) portrays and celebrates Greek heritage and the Hellenic legacy through educational classes, exhibits and programs. With a growing repository of over 20,000 artifacts, the Museum catalogs and highlights the contributions of Greeks and Greek Americans to the American mosaic and inspires curiosity about visitors’ own family journeys through cultural expression, oral history and experiential education. Located in Chicago’s Greektown, the NHM provides lifelong learning for the whole community using artifacts and stories to spark inquiry and discussion about the broader issues in our lives. For more information, their website is nationalhellenicmuseum.org and their phone number (312) 655-1234.